An accident on a local Dutchess County job site has resulted in the death of a woman who worked on the site. The accident occurred on Thursday, April 13, 2017 in Red Hook. A 44-year-old woman from Elizaville was working for Jeff Decker & Son on a field-leveling project on a site located on Albany Post Road. The accident occurred at around 1:15 in the afternoon, while the woman was on foot near a large piece of field equipment. A coworker who was tasked with operating an 18-ton field tread bulldozer was adjusting the blade on the machine. When he looked up, he realized that the bulldozer had struck the victim, and he called for emergency assistance. Members of the New York State Police, Village of Red Hook Police, and Dutchess County Sheriff’s Office responded to the scene of the accident, and the accident victim was transported to the Northern Dutchess Hospital. She was pronounced dead upon arrival. The Occupational Safety and Health Administration (OSHA) was notified of the accident by State Police, and an investigation is ongoing. Bulldozers can be very useful – but very dangerous – pieces of equipment on a job site. OSHA reports that struck-by accidents are one of the most common causes of construction-related fatalities, and that 75% of these accidents involve this sort of heavy equipment. In order to prevent accidents involving rolling bulldozers, OSHA has issued detailed regulations and safety guidelines on bulldozer use. Workers are instructed to check vehicles before their shift to ensure they are in proper working order. Whenever a large machine is not in use, the parking brake should be set, and the wheels should be angled when parked on an incline. Workers near the bulldozer should be wearing brightly-colored or reflective clothing. Bulldozer operators should never drive a vehicle in reverse when the rear view is obstructed unless another worker on the ground can help direct the vehicle, or the vehicle has an audible reverse alarm. 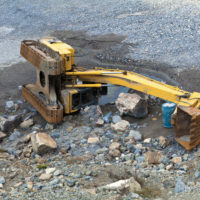 When site managers fail to instruct workers on proper safety technique, or independent contractors provide defective equipment or negligently fail to operate that machinery correctly, you may have a claim for money damages based on your injuries. For assistance with getting the money you deserve after an injury on the job in New York, contact the dedicated and knowledgeable Hudson Valley construction accident lawyers at Rusk, Wadlin, Heppner & Martuscello, LLP for a consultation, at 845-331-4100 (Kingston), or 845-236-4411 (Marlboro).